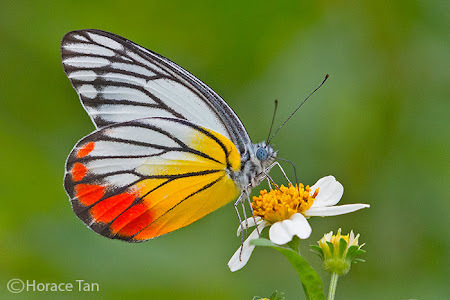 The Painted Jezebel is widespread in Singapore. It is regularly observed in urban areas, parks and gardens and also in the forested areas of our nature reserves. The butterfly flies restlessly, often at treetop level, but sometimes comes down to feed at flowers. This shot, taken by ButterflyCircle member Horace Tan, shows a Painted Jezebel feeding on the flower of Bidens pilosa, a common "wildflower" that has been spreading rapidly across the island. The Painted Jezebel is known to be distasteful to some predators, and its aposematic or bright "warning" colours are a sign to predators that it should be avoided. Even its caterpillars are bright yellow and very obvious when feeding on its caterpillar host plant, the mistletoe Dendrophthoe pentandra. Whilst the Painted Jezebel shares this host plant with other species like the Green Baron (Euthalia adonia pinwilli) and the Peacock Royal (Tajuria cippus maxentius), it is curious why only the Painted Jezebel is able to extract any protective benefit from the plant, whilst the other two species are not known to be distasteful to birds.